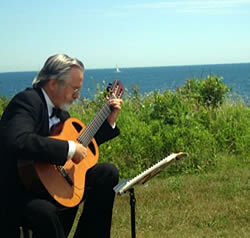 Robert Phelps, guitarist has been an Artist Associate of Guitar at Williams College since 1990. He is a performing member of the Williams Chamber Players and Jazz Faculty. In 1992, Phelps was the featured soloist at the Guitar Alumni Series of the Yale University School of Music, from which he holds a Master of Music degree in guitar performance. He is also a Mel Bay author. Among his publications, Mel Bay's Guitar Workbook was endorsed by guitarists Oscar Ghiglia and Robert Guthrie. The book was used as a class text in classical guitar fingerboard harmony at the Eastman School of Music, and was the subject of a feature review in Soundboard. (summer, 1996 by John Holmquist). The book was a suggested text at the Berklee College of Music by Larry Baione, Chair of the Jazz Guitar Department. In addition to premiering works at the College Music Society meetings, Phelps has performed several Canadian-American exchange concerts and master classes at the University of Moncton, New Brunswick, Canada. In 1996, he joined Trio Sonata, a flute, oboe, and guitar trio, which has concertized throughout the United States and Canada. He has 2 cd's: Six On Two(GG-1025) for solo guitar, and another with his Trio, Music For Flute, Oboe, and Guitar(GG-1014). Both are on the Gasparo Label. These cd's are available through his website. Mr. Phelps has also played in major theater productions at the Hartford Stage Company and at the Barter Theater, the state theater of Virginia. His students have been accepted into major graduate and undergraduate performance programs across the country.